Wildfires do more than threaten lives and destroy properties, they also affect our health, amenities, and threaten our natural resources such as water, air, wildlife, and our natural habitat. The warmer temperatures and reductions in rainfall that we are currently experiencing lead to very low moisture levels in the vegetation surrounding our communities; particularly those in the Wildland Urban Interface (WUI). Drier vegetation coupled with prolonged drought could increase the severity and frequency of wildfires. Fires could contribute to climate change, through the release of carbon dioxide with vegetation burns, and this impact could worsen if the number and scale of wildfires increases. 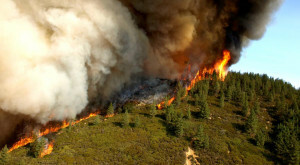 Across the Western United States, wildfires have become more frequent and the fire season has become longer. It is imperative that San Diego County residents, particularly those in the WUI, are prepared for dealing with wildfire; because it is not a matter of if, but when.